On the 16th anniversary of June 4 1989, the Hong Kong Alliance in Support of Patriotic Democratic Movements in China organized its traditional candlelight meeting. How many people were there? For the local media, the rules are standardized by now: the organizers will put in a claim, and the police will release its own estimate. Both numbers shall be reported, with no indication of which is right or wrong. Just the facts. All in the name of fairness, balance and social harmony. How does the police come up with their number? Typically, such numbers are obtained via area density estimates. For reasons of public safety, such meetings are not allowed to be freely mixing among all participants, because the crowd might unknowingly surge forward and crush each other. Instead, the crowds are roped off into sections, and each section is populated by an allowable number of people. Total area multiplied by expected density gives the estimated number of participants. The accuracy is not known, since much depends on the assumed density estimate. (Apple Daily) The Hong Kong Alliance in Support of Patriotic Democratic Movements in China estimated 45,000 citizens attended, whereas the police figure was 22,000. 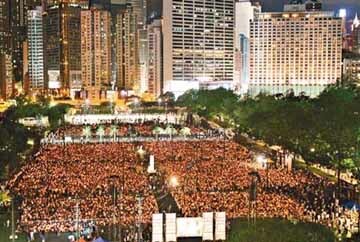 (SCMP) ... the estimated 45,000-strong crowd ... but police put the figure at 22,000. (Ming Pao via Yahoo! News) Tens of thousands of lit candles once again illuminated five soccer fields inside Victoria Park. Several tens of thousands of citizens attended the candlelight meeting on the 16th anniverary of June 4. The organizing Alliance in Support of Patriotic Democratic Movements in China claimed 45,000 citizens attended the evening meeting, 45% fewer than the 82,000 last year ... the police estimated that 22,000 attended the meeting. (Sing Pao) Although the number of participants was 37,000 fewer than the 15th anniversary event last year, and the pouring rain caused the schedule to be abbreviated, it did not dim the enthusiasm of the 45,000 citizens ... only a few dozens left on account of the rain. But the police estimated that only 22,000 attended the assembly. (Oriental Daily) The organizers claimed that 45,000 attended, which is 45% fewer than last year, but the police said that only 22,000 attended. Wen Wei Po and Tai Kung Pao made no mention of the event at all. The foreign media do not understand the local rules, so they will say whatever they want (or need to due to deadlines). (Bloomberg) About 45,000 people turned out on Saturday evening to commemorate. (Reuters) Organisers estimated a crowd of 45,000, or about half the turnout last year. (Associated Press via The Guardian) In Hong Kong, a crowd estimated by organizers at 30,000-40,000 raised candles in the air in Victoria Park. (New York Times) Organizers put the crowd here at 45,000, while the police estimated it at about half that size. The crowd was visibly smaller than in the last two years, when many in Hong Kong were deeply unhappy with economic stagnation here and the local political leadership.